I’ve always wondered exactly what newspaper story he was talking about, but only now (thanks to a trip to the National Archive) have been able to locate it. ---- If anyone wants a copy, feel free to ask, a computer scan of the article can be emailed to you. – The other articles in this series are: "
My attention has been called to an item from the El Paso, Tex, “Times”, issue of November 10, 1941, headed “Gang of Marihuana-Crazed Hoodlums Leaves Bloody Trail”. Please advise if there is any basis for the statement that these men had been smoking marihuana. On November 23rd, 1941, the writer called at the El Paso times office and interviewed Bill Haworth. Mr Haworth stated that he wrote the item but that the hading “Gang of marihuana-crazed hoodlums leaves bloody trail” was composed in the editorial room. Mr. Haworth further stated that he had received his information from the records of Capt. 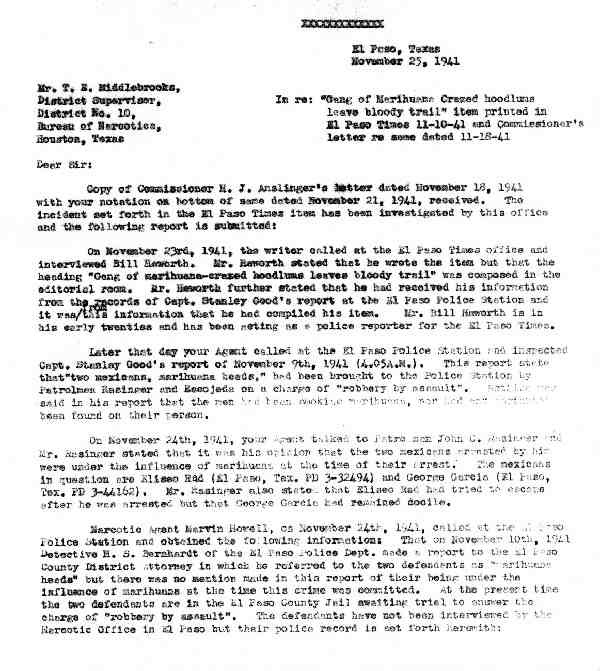 Stanley Good’s report at the El Paso Police Station and it was from this information that he had compiled his item. Mr. Bill Haworth is in his early twenties and has been setting as a police reporter for the El Paso Times. Later that day your Agent called at the El Paso Police Station and inspected Capt. Stanley Good’s report of November 9th, 1941 (4.05A.M.). This report states Patrolmen Rasinger and Escojeda on a charge of “robbery by assault”. Nothing was said in his report that the men had been smoking marihuana, nor had any marihuana been found on their person. 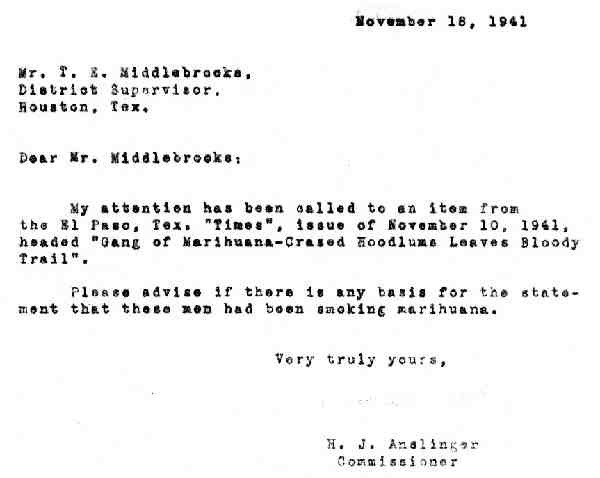 On November 24th, 1941, your agent talked to Patrolmen John C. Rasinger and Mr. Rasinger stated that it was his opinion that the two Mexicans arrested by him were under the influence of marihuana at the time of their arrest. The Mexicans in question are Eliseo Red (El Paso, Tex. PD 3-32494) and George Garcia (El Paso, Tex. PD 3-44162). Mr. Rasinger also stated that Eliseo Red had tried to escape after he was arrested but that George Garcia had remained docile. Arrested 7-28-41 – El Paso P.D. Arrested 11-9-41 – El Paso P.D. No previous record of arrest up to 11-9-41. 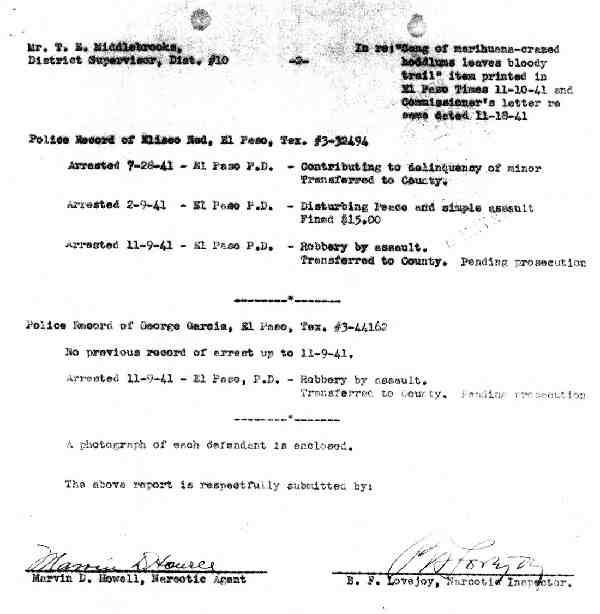 Arrested 11-9-41 – el Paso, P.D. A photograph of each defendant is enclosed.